Welcome to Day 21 of the 40 Day Herbalist Challenge! Today’s Challenge examines ways that herbs can be used as part of a natural approach to stress management. I hope you will forgive the lack of lovely pictures to go with today’s post. This past week has been an interesting experience in terms of tech and electronics for us here at the Indie Herbalist, but we hope to have things back on track later in the week, at which point we will add graphics back to any posts that are lacking. Thank you for understanding, and enjoy today’s Challenge! Stress can actually be a good thing sometimes, but it can take a toll on the body when it’s continuous. Physiologically, stress can elevate blood pressure, cause trouble sleeping, upset your stomach, and have a major impact on mood and emotional wellbeing. It can also have a role in chronic problems like Type 2 diabetes, arthritis, and asthma. There are two main categories of herbs that herbalists are most likely to reach for when working with an herbal approach: nervines and adaptogens. Adaptogens have an overall balancing influence on the body’s response to stress while nervines target and support the nervous system more specifically, although many adaptogens also have nervine properties. Typically when working with herbs that support a healthy response to stress you will want to work with herbs that you can use throughout the day (2-3 times a day is usually a good place to start). If you feel especially stressed at night or while you are trying to wind down to sleep, some nervines (like hops and california poppy) are more likely to cause drowsiness and so are more appropriate for evening use rather than daytime use. Some, like passionflower and linden, can be used either day or night by most people. 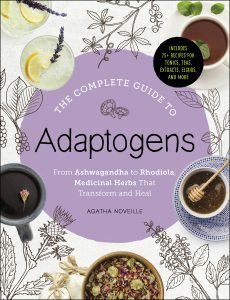 Adaptogens are often better for daytime use. Some adaptogens can be very energizing or at least promote feeling focused and awake so they may not be the best choice for evening use. 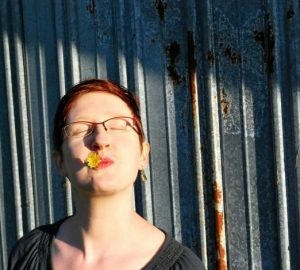 Others, like tulsi or ashwagandha, are more calming and may be fine to use in the evening unless you are very sensitive. Nervines and some of the more calming adaptogens usually blend well in formulas or they can be used as single herbs. What about stress and pregnancy? What about stress and children? Linden, chamomile, and catnip are traditionally believed to be safe for children. For the rest of today’s Challenge, let’s look at five nervines and adaptogens that are particularly helpful when you are feeling stressed out. This calming adaptogen is an Ayurvedic rasayana, herbs that were traditionally believed to support balanced vitality and long life. Besides being used as an adaptogen and nervine, tulsi is also sometimes used as a carminative and expectorant. It’s very easy to grow from seed and can be grown as a garden annual in many areas. I’ve also heard it can be grown in pots indoors, but I’m not having much success with mine (probably due to low light). It may depend on the variety, as there are several different varieties. They can all be used interchangeably. Safety: tulsi shouldn’t be used during pregnancy and it may be best to avoid using it if you are on prescription medications since there is some research suggesting it can increase how quickly your body eliminates medications (which could cause your prescribed dose to be inaccurate). Another calming adaptogen and Ayurvedic rasayana, ashwagandha has a reputation for being a very good adaptogen to use if you have become rundown and exhausted from a long period of being under stress. It’s one of the most calming of the adaptogens and many people find they can use it at bedtime. It’s distantly related to tomatoes and can be started from seed and grown in the garden under similar conditions. Safety: Ashwagandha should be avoided during pregnancy and can increase the effect of barbiturates so do not use while taking sedatives. It also may be best to avoid using ashwagandha if you have hyperthyroidism or hemochromatosis. Linden are beautiful landscape trees. A nervine, this herb is especially balancing if your stress levels are causing you to feel restless or anxious. Traditionally it is also used as a diaphoretic and antispasmodic. According to herbalist Sharol Tilgner, linden flower is a specific when you are out of balance in a way that you feel worse in the afternoon and evening and from keeping still, but feel better in cool rooms and from moving around. It’s also a trusted herbal ally when your stress is accompanied by palpitations and hypertension. Herbalist David Hoffman notes it is particularly helpful for nervous tension. Safety: No known contraindications or safety concerns. Contact dermatitis and allergic rhinitis have been reported in sensitive individuals. This beautiful tree is an uplifting and calming nervine that is native to China but naturalized in the Southeastern United States. Besides being used as a nervine, the bark was also applied topically in TCM for supporting recovery from physical injuries. Many herbalists consider it a specific for grief. It’s more common to use this as an extract instead of a tea because it is easier to find in that form. Safety:The bark is a blood mover (emmenagogue) so avoid use during pregnancy and be careful when combining with antidepressants. A native to the Southeastern United States, passionflower is a vine that grows wild but also happily adapts to garden life. If you grow it in your garden it can be trained to trellis but on it’s own it will sprawl over the ground and climb up other plants. The vine and stem are harvested and dried for herbal uses. Although I know of one herbalist who claims it only works for women, I haven’t found that to be the case and use it for men and women. I have have also found it to be very helpful for short term use in horses, dogs, and cats. Another nervine with antispasmodic virtues, it can be a nice addition to respiratory support blends. Knowing the details about the ways stress acts on the body can be key in helping you better understand just how wide reaching the effects can be. For today’s Challenge, I hope you will further investigate the ways stress can impact your body and mind by browsing these articles with Web MD and Mayo Clinic While you read, make notes for yourself. Do you think stress may be playing a role in your health? What ways seems to stand out to you the most? I also hope you will consider making one lifestyle change to help you manage stress productively. Stress can seem like a big, huge thing, but even making one or two small changes can help us feel better in a big way. Mayo Clinic has a list of several ideas, and Web MD has a list of 10 Tips to Manage Stress to help you get started.